A softer bodied cheese with a buttery quality and colour with a deep full cheddar flavour. The Somerset wedge is made to a traditional cheddar recipe using cows milk taken from our own herd of Red Devon and Channel Island crosses. 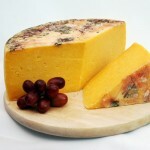 The cheese is made into 15kg truckles and 5kg wheels clothbound, matured for 12 months or more.